This minimalist home is airy, full of clean lines and modern design! 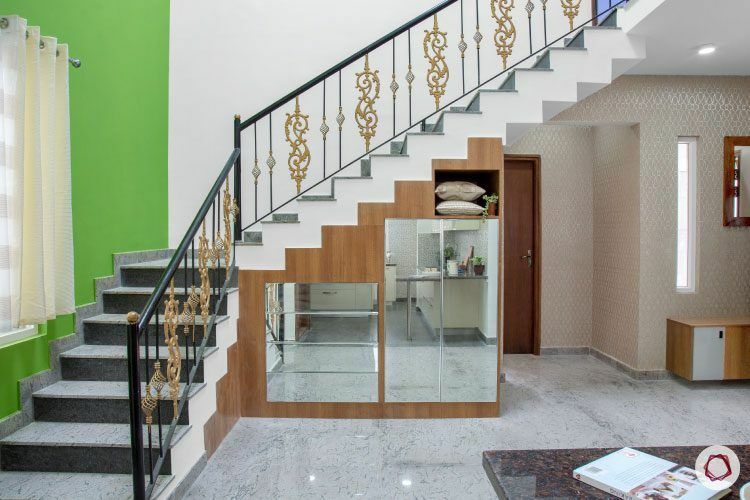 Deepak Kumar and his wife, Deepa always wanted a home that was away from the hustle and bustle of the city – a holiday home where they could unwind with their son and daughter, and also have the option to rent it out when not in use. 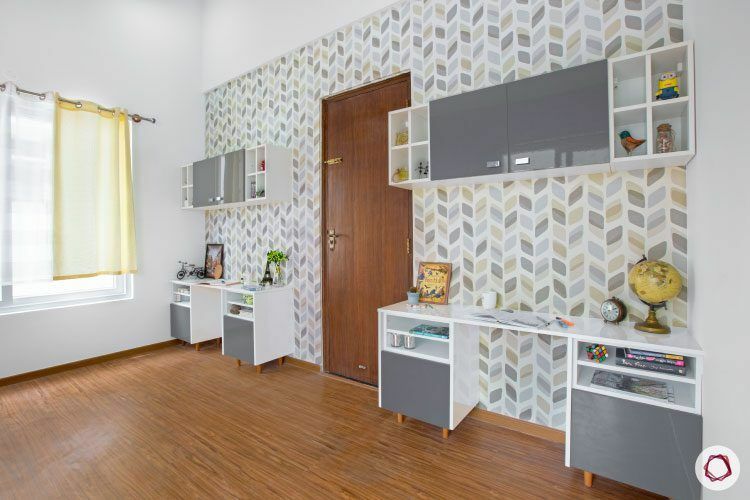 Sprawled across 1,950 sq ft, this villa on Kanakapura road gave them the vacation vibes they were looking for! 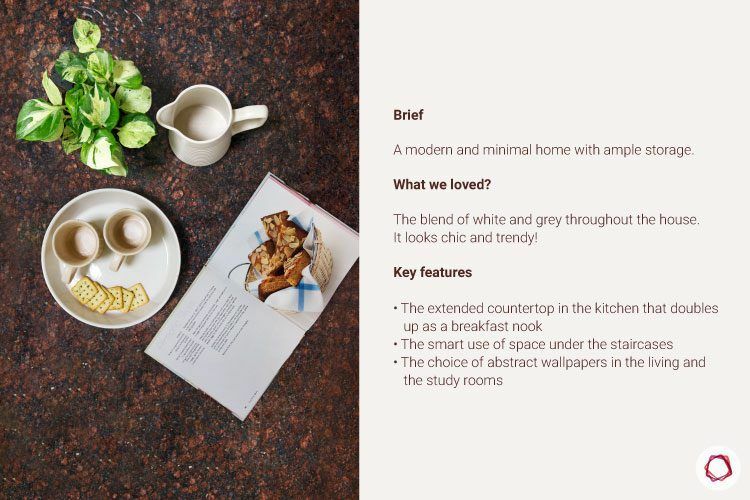 To complete the feel-good factor about their home, they wanted elegant and minimalist interiors. Enter Livspace! 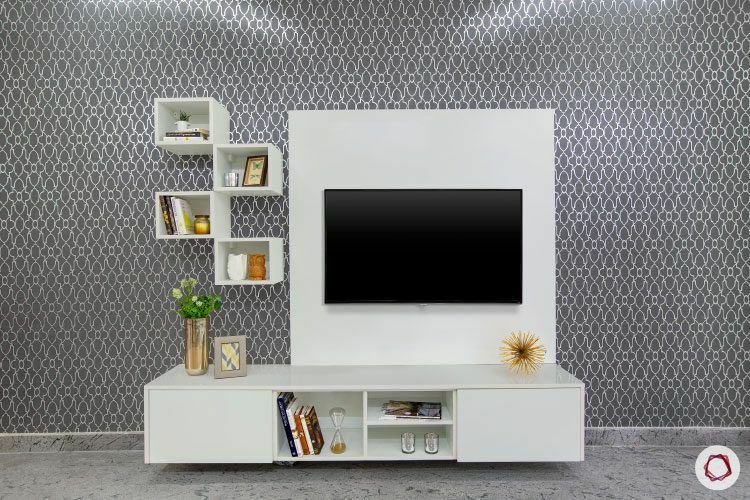 Our designer, Bhagyashree M put in shades of white and grey throughout the house and ensured they would never have a struggle with storage. Here’s a peek into their home. 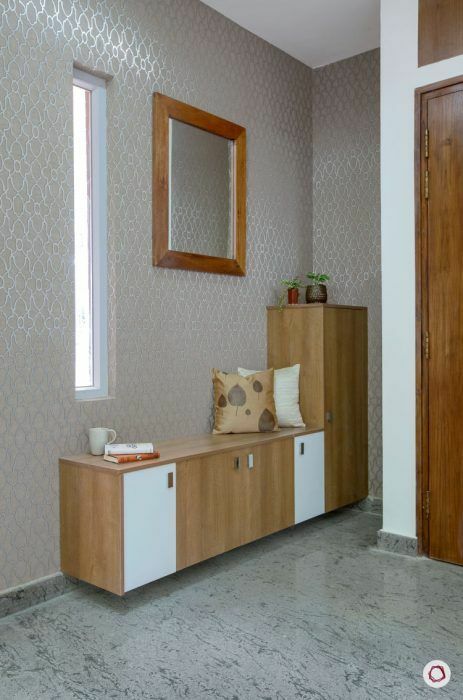 At the entryway, Bhagyashree gave them a sand brown shoe cabinet with extra storage. It also has a seating option that works well on a rushed morning. Above it, a wooden framed mirror adds the right amount of elegance to the foyer. 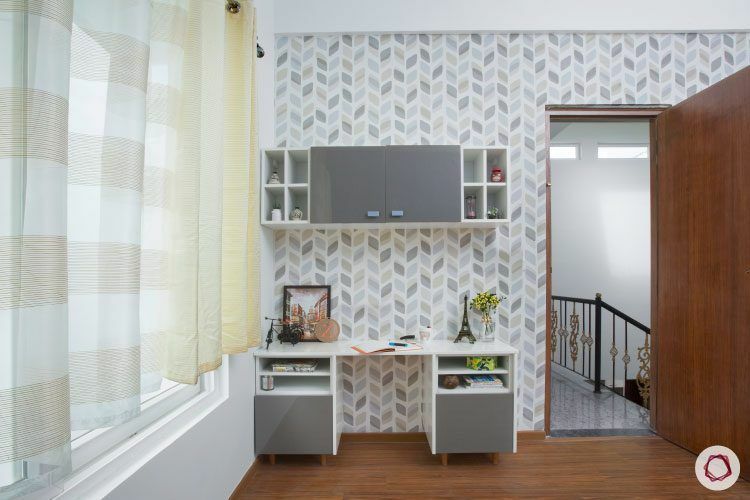 For Deepak and Deepa, their living room had to be contemporary and comfortable. The open living room that extends to the foyer and dining area, is also quite breezy. 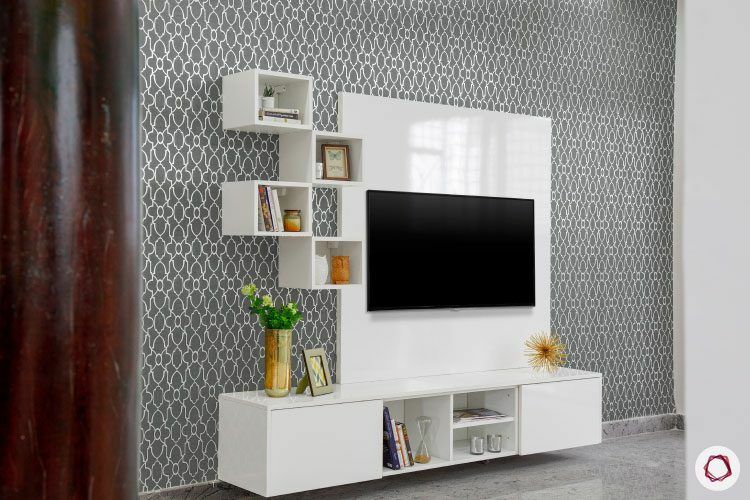 Keeping this in mind, Bhagyashree kept the room minimal with a frosty white TV unit that has both open and closed shelves. 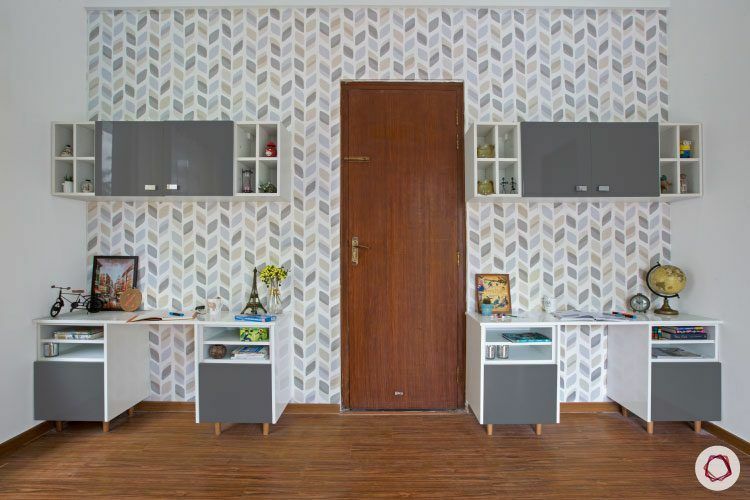 But of course, the highlight of the room is the slate grey abstract wallpaper that perfectly matches the marble flooring. 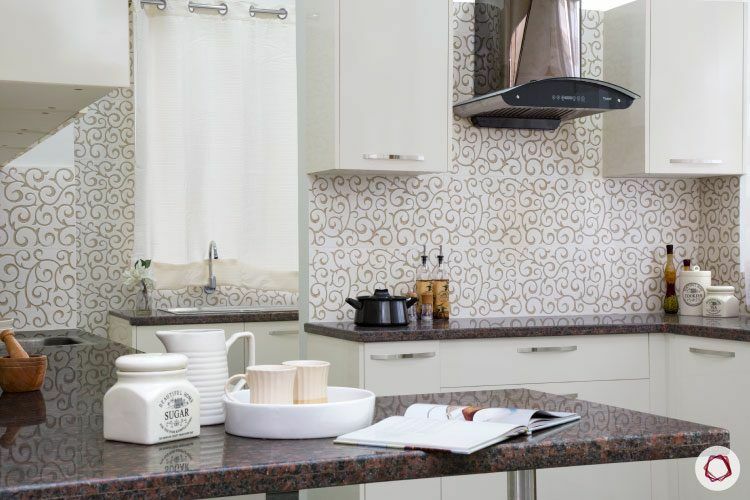 For Bhagyashree, the kitchen proved to be an interesting challenge. 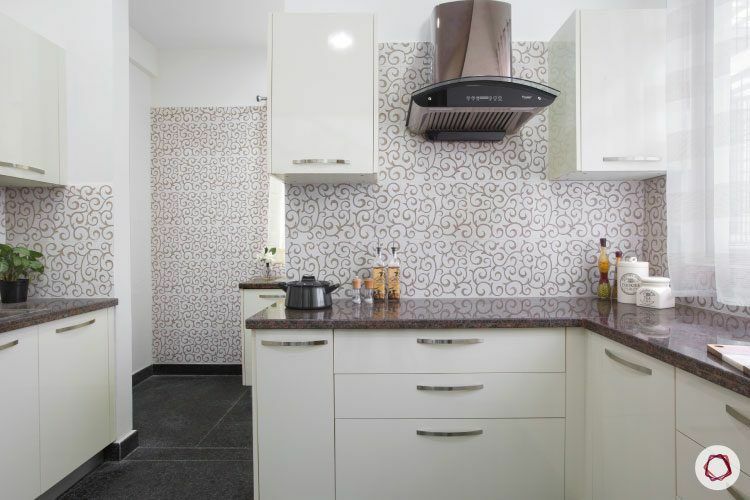 Since the kitchen was designed with Vastu guidelines in mind, the layout was not a typical one. 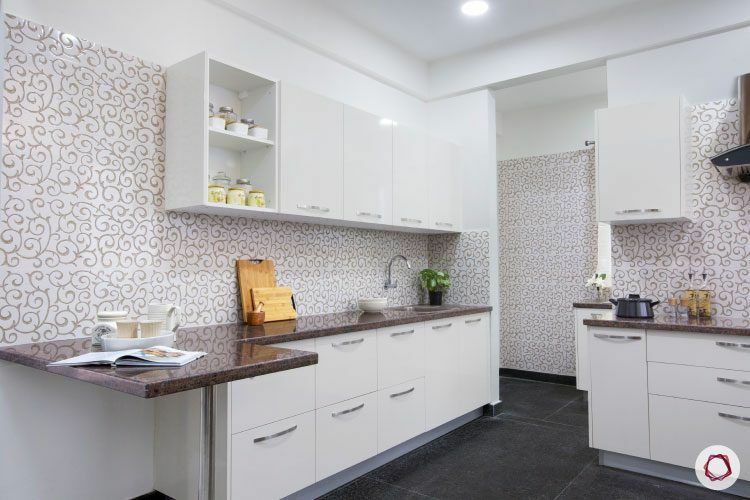 The Kumars wanted the kitchen to be done up in light shades with ample storage options. And she delivered a kitchen that was spot on! 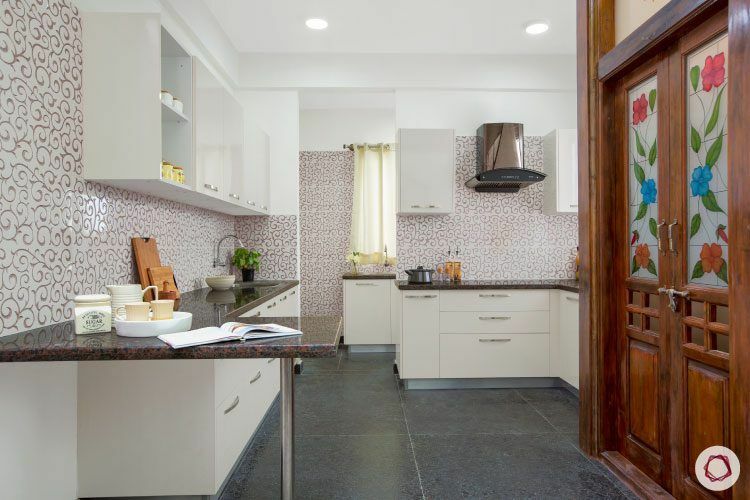 She put in abstract wall tiles that complements both the granite countertop and cabinets. 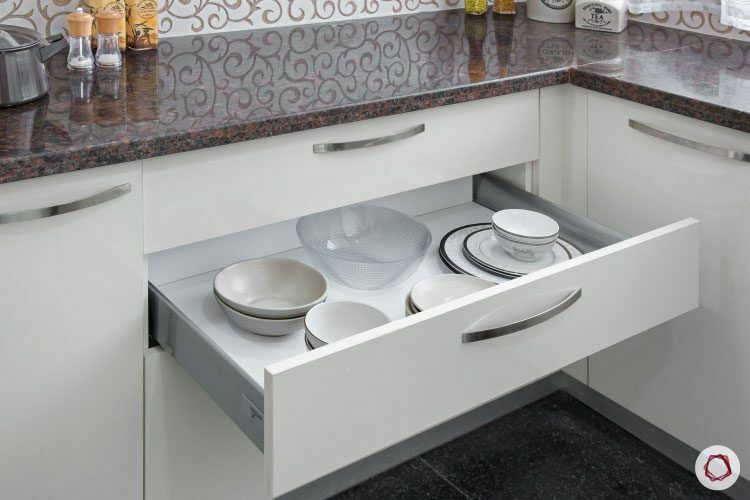 The kitchen has plenty of storage thanks to the intelligent utilisation of the layout. An open shelf offers the only glimpse into their essentials in this otherwise clutter-free and well-organised kitchen. The family of four wanted to have a breakfast nook in the kitchen as well. 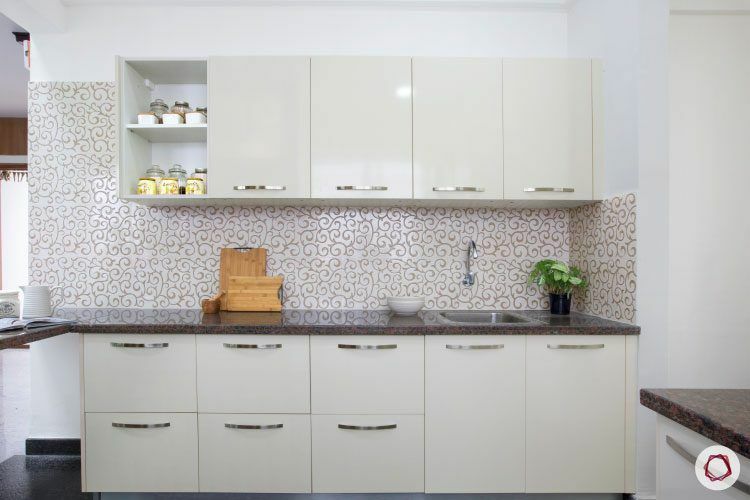 Bhagyashree extended the countertop to create a quick dining experience. And it also offers more working space! 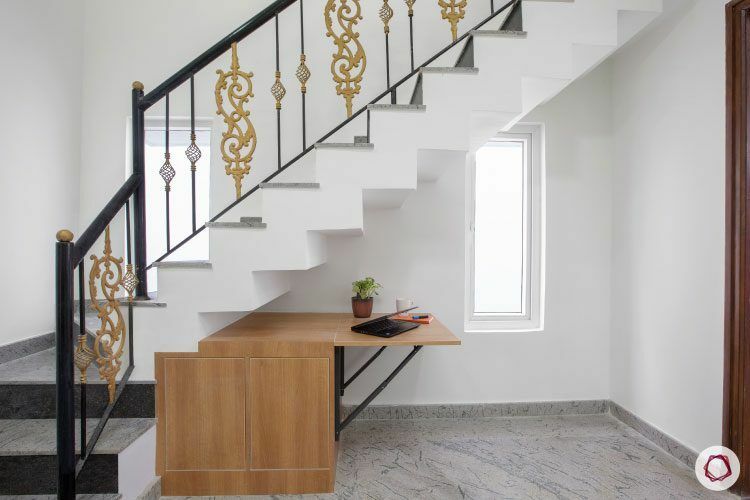 The Kanakapura villa has two sets of stairs that lead upstairs. Bhagyashree ensured the space under the stairs wouldn’t get forgotten and abandoned. 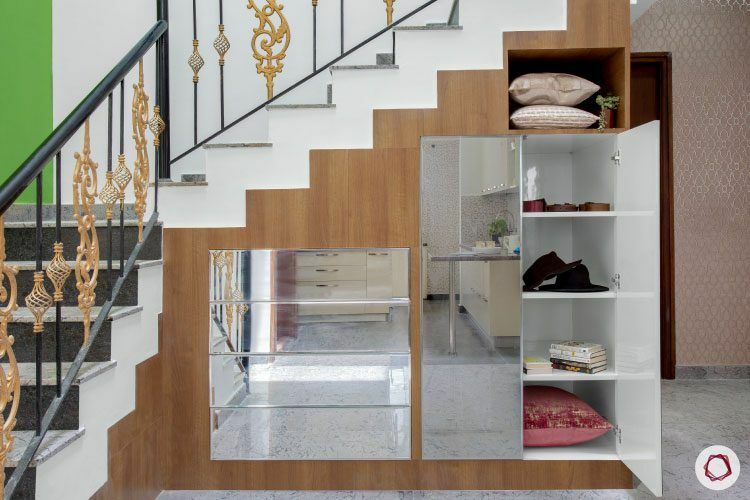 Under one, she put in a crockery cabinet with beautiful mirror panels. Under the other, she added a foldable table that also works well as a study corner. Talk about smart spaces! 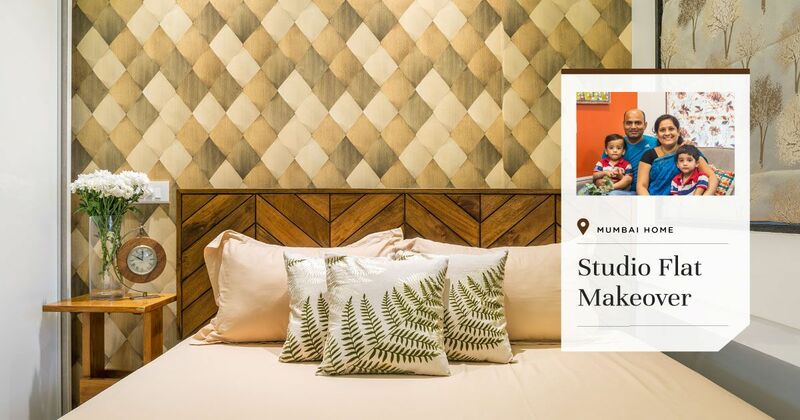 In the kids room, they put in two identical sets of study units that blends well with the abstract wallpaper. The study tables have box shelves to store their essentials. The room appears well-lit also, thanks to the sheer curtains. 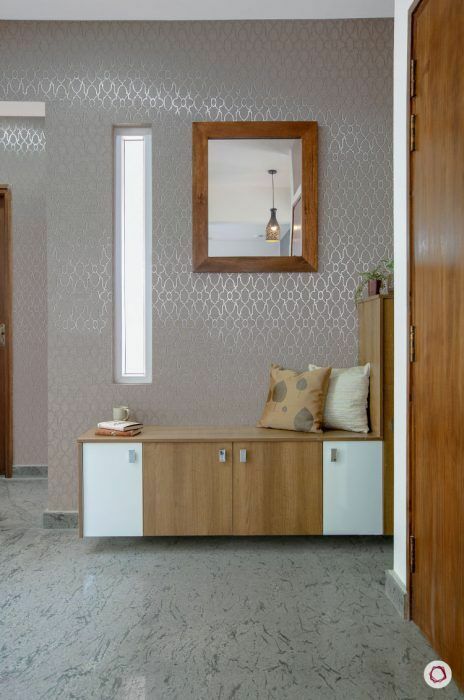 All this over polished wooden flooring that matches with their contemporary theme. 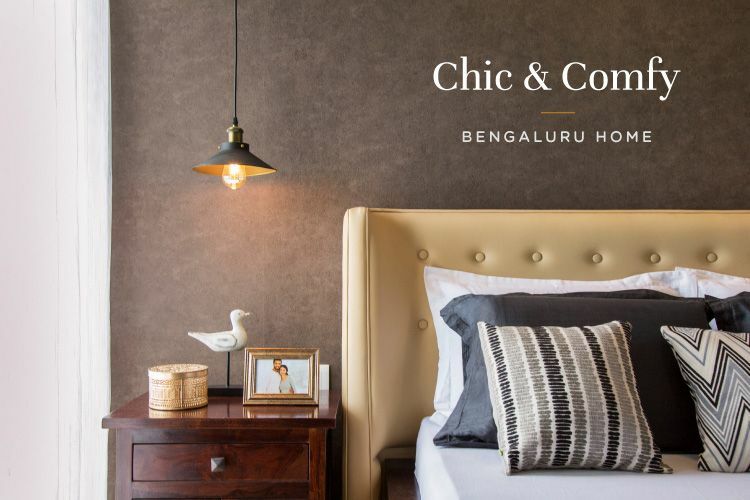 Unlike the rest of the house, Deepak and Deepa wanted a different theme for their master bedroom. They wanted a classy theme with more wooden shades. With a lavender coat of paint on their walls, the room looks delicate under sheer curtains. 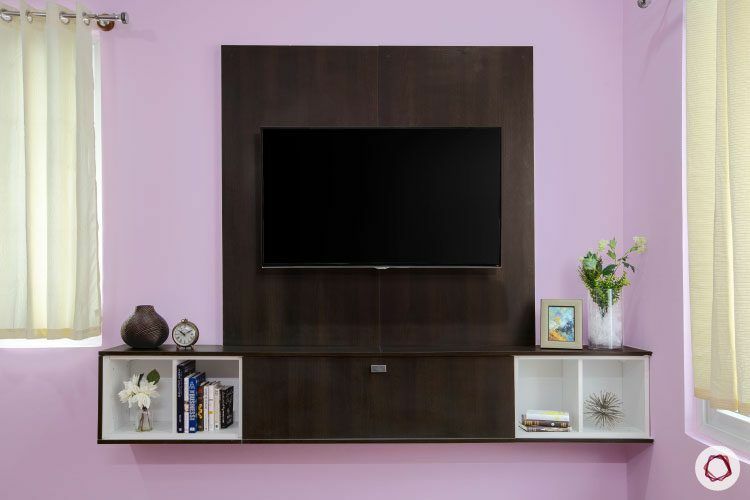 A dark brown TV mounted on the pretty wall is the most striking feature of their room.